Instead of using the Internet to connect with each other, imagine a world where physical devices can connect for you, without you having to do a thing. Physical devices are being embedded with sensors, chips or actuators, which communicate with other surrounding objects. As a result, companies are able to understand exactly how people use their products, obtaining information beyond just sales data. This is the Internet of Things. With big brands such as Adidas, Google, Oakley and FedEx hopping on board, the Internet of Things is already a reality. 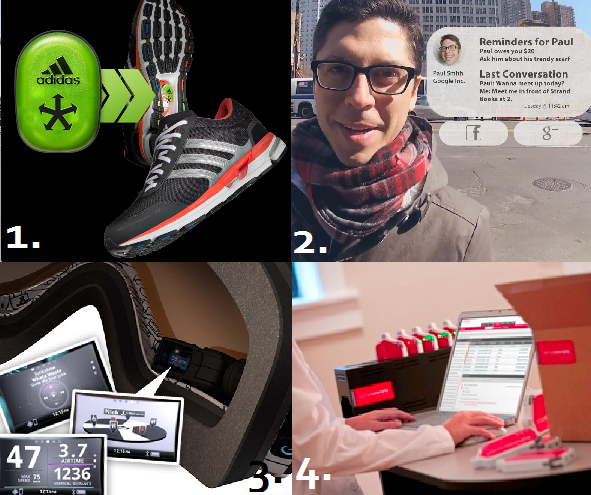 Adidas miCoach, a “cell” that fits into a sports shoe and syncs with an app to measure the user’s sports performance. It has the ability to measure the intensity and distance of the users’ activities. Google Glass, a pair of glasses that augment reality. Oakley Airwave Goggles, a pair of goggles that have the ability to track skiers’ and snowboarders’ speed, jump analytics, navigation, music, and more. FedEx Sensaware, a multi-sensor device that collects and transmits data from packages using wireless communication, to provide online application for monitoring and analysis. Through the Internet of Things, businesses are capable of reading and analyzing data to understand their consumers’ relationships with their products and brand. From these insights, they can create better products that meet, and even exceed, consumer expectations. The Internet of Things is slowly becoming a reality, the only question is how pervasive it will be.